As I spend more time working with Rust, I find myself hitting more edge cases, and ultimately into learning more about how Rust is implemented. Posted at 14:30:00 BST on 8th June 2015. With the partial image and seeding support in my Rust path tracer, I was finally able to do what I had hoped…use some idle time on my work computers to render a “proper” number of samples. What 127,000 samples per pixel looks like. Well, there you go then! Posted at 01:50:00 BST on 3rd June 2015. Previously, I appealed for help with my little Rust path tracer. Thankfully I had some help from Phil Dawes and now at least I “get” error handling, or at least I think I do! The only thing remotely exception-like is the last-resort “panic” that prints a diagnostic message and exits the current thread. Posted at 18:30:00 BST on 2nd June 2015. Last time I looked at Rust’s performance vs C++ for a simple path tracer. Since then I’ve been further hacking on the source to get a little extra functionality, like partial rendering and merging (so I can try out some distributed rendering). I guess the honeymoon is over. I tried a bit of “simple” file manipulation, and I’m finding all sorts of trickinesses. 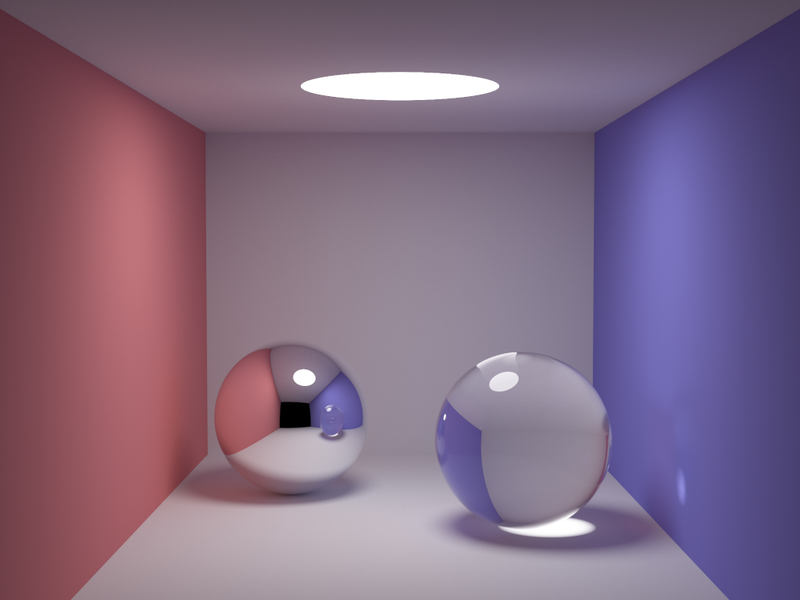 In this post I am referring to this version of path-tracer on GitHub. I’m sure by the time anyone reads this I’ll have found workarounds, so check the most recent version to see how I’m getting on. Posted at 14:00:00 BST on 1st June 2015. In my last article I described my port of smallpt to Rust. In this short post I’m updating with some performance figures. I’m really impressed; the Rust version really is as good as the C++ version! I tested on my home server, a 4-core 2.5GHz X3323, which was otherwise idle. Due to some stack limitations in Rust, the Rust code bails out after 500 levels of recursion; so I modified smallpt to do the same. Posted at 05:05:00 BST on 26th May 2015. Over the last couple of commutes to and from work I’ve been playing with Rust, which went v1.0 over the weekend. Rust is touted as a systems language in the same vein as C, C++ and to a lesser extent, Google’s Go. It offers both high level abstractions like generic programming and object-orientism while also giving access to lower-level facilities like fine-grained memory allocation control and even inline assembly. Critically for me, it has a “only pay for what you use” mentality like C++, a well-sized standard library and runtime, and no garbage collection. It’s quite feasible to use Rust to make a “bare metal” system in (for example, Zinc). Posted at 18:40:00 BST on 21st May 2015.